Leeds Train Station is an approximate 14 minute walk away from our City Campus and is very well connected to many of the UK’s major towns and cities. Sheffield is accessible in just 1 hour, Manchester in 50 minutes, Liverpool in 1 hour 25 minutes, Birmingham in 1 hour 50 minutes, and London in 2 hours 20 minutes. If travelling by rail, when leaving the station take the exit onto Wellington/Aire Street and walk along Park Row and Cookridge Street. For information on times and prices, check Trainline.com or download the app. If you’re travelling on foot, you can plan your route using Walkit Leeds, to find the most convenient route. If you’re planning on coming by bus, First operate a large number of services in the city centre. 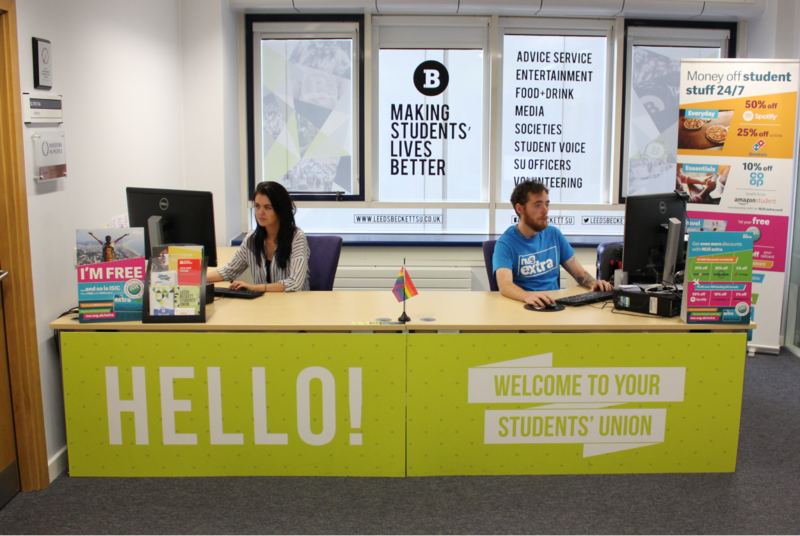 The number 1 and 6 run every few minutes and stops a few metres away from the Leslie Silver building where the Leeds Beckett Students' Union offices are based. For more details, check firstgroup.com/leeds or download the app. When possible, we’d advise travelling by public transport into Leeds City Centre to avoid traffic and car parking charges. However, if you’re planning on driving there is a convenient public pay and display car park at the Rose Bowl (for Sat Nav use LS1 3HB). The car park is split into two sections; directly outside the Rose Bowl there is an open-air car park and there is an underground car park below the Rose Bowl. Both are accessible via Portland Crescent. Car parking is also available at the Woodhouse Lane car park using post code LS2 3AX for your Sat Nav. Headingley train station is situated on Kirkstall Lane and is an approximate 20 minute walk to Headingley Campus. When walking from the station, the quickest route is via Queenswood Drive and Beckett Park. Trains between Leeds and Headingley run twice an hour. For details on times and prices, check Trainline.com or download the app. If you’re travelling on foot, you can plan your route using Walkit Leeds, to find the most convenient route as to where you need to go. If you’re planning on travelling by bus, First operate a large number of services. The 1 and 6 run every few minutes through Leeds City Centre and travel along Otley Road in Headingley. If travelling on either of these services, get off where Otley Road meets Church Wood Avenue and Headingley Campus is less than a 10 minute walk away. Visitors to Headingley Campus should use the main entrance off Churchwood Avenue (for Sat Nav use: LS16 5LF), as St Chad’s Drive entrance is for permit holders only. There is a public pay and display car park at Headingley Campus accessed from the Churchwood Avenue entrance.